Accommodation: 3 star catagories Hotels in Kathmandu and Pokhara and local guest house during the trek. 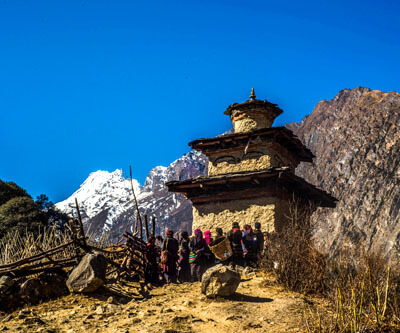 Classic Annapurna circuit trek will be one of the longest treks in Nepal that will offer impeccable mountain scenery. In short, it can be called the mountain bliss. It was in 1980’s when this trek opened its gates for the world and since then, this 250 kilometers of trekking has won hearts and captivated people in every way. You will walk through villages inhabited by different races of people, welcomed by beautiful little children with never ending namaste and surrounded by mountains at all times. 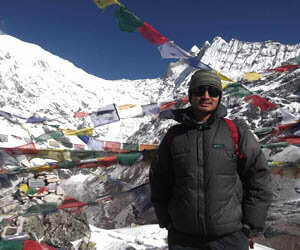 The Annapurna circuit trek is very liberal when it comes to trek put in destination. With construction of roads on the both parts of the trek you have option of completing the trek within 10 days. But however, if you want to experience the real Annapurna circuit, roads aren’t real concern as there are several inner routes constructed to avoid them and provide you with genuine natural experience. The landscape changes very soon and in the matter of just 2 weeks you will experience all climate zone, from subtropical to alpine. Furthermore, the challenge exists walking from 800 meters to one of the highest passes of Thorung La at 5400 meters but nevertheless, the sense of achievement is immense and the pain is soon forgotten. 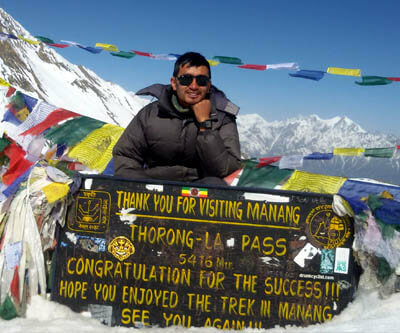 You will as well see the two most beautiful destinations in Annapurna circuit and they are Manang and Mustang. These rustic villages, practicing culture dating back to 1500 years, will never fail to melt your heart. 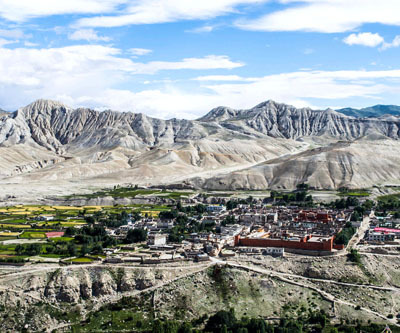 The stone house, the kanis, the chortens, beautiful monasteries build with local resources, attire and way of life is something the world has yet to explore. Being in one of the remotest and scarce locations of Nepal, people here radiate happiness and true meaning of being alive. All the offerings in one trek, and not just any other trek, but the heartthrob of all treks in Nepal ‘Annapurna circuit trek’. Come join Crown Eco adventure and experience adventure in a responsible way! Day 01: Arrival in Kathmandu and hotel/ hostel transfer. Day 02: Sightseeing and trek preparation. Day 18: Pokhara – Kathmandu. On this day you arrive to Kathmandu and we transfer you to your accommodation. There is no plan set aside for the day but you can feel free to explore the surrounding to get hang of Nepalese culture and tradition. Overnight in Kathmandu . We embark on the national highway as early as possible. Depending on the package of your choice, you will board either a private vehicle or a bus. However, in case of a bus, you will be transferred to a smaller vehicle after Besi sahar. The road of the first half is black topped and travels along rivers and showcases pretty lush green forests. Whereas, the second half of the road is more of a off road experience. Nevertheless, this slightly over 8 hours of on road experience will be very new to you if this is your first ever visit to Nepal. The bus will stop frequently in between, allowing you ample amount of time to catch something to eat as well as use the bathroom. Overnight in Khudi. Comparatively, today will be technical as well a strenuous but you will walk through one of the most beautiful pine forests. Be careful as you walk on landslide prone area which you will come across on this very day. Since the trail is steep, it is advised to take your time to cover the distance. Meanwhile, do not forget to look towards the north for beautiful views of Lamjung Himal, Annapurna I and Annapurna IV. After walking for around 6, the stone and mud plastered gates of Chame welcomes you. From the gate you will see the beautiful village of Chame where you will call it a night. Today we leave early in the morning after breakfast, to ascent 600 meters through a mediocre difficult trail. From the very first day Marsyangdi river never leaves the trail and does the same for this day. We start strolling on a relatively flat ground in the beginning and then gradually climb upwards. The first noticeable village on this day is Humde - the only village in Manang with airport. After crossing Humde the landscape gets more barren but the views get better. The views of Annapurna III and IV on one hand, and the barren cliffs on the other is captivating. We usually stop for lunch in Mungi. one and half hours easy uphill walk after lunch we make it to Manang. We traverse through various terrain and through the fields of buckwheat, barley and potato and pine. On this day we make our way through remarkable Kani’s (gate) to rustic settlements of Tibetan community namely Manange. Overnight in Manang. Approximately 3 hours before the scheduled flight, a representative from the Crown Earth treks will take you to the airport. All airport/ hotel transfers by private vehicle. 3 nights accommodation with breakfast at a 3 star hotel in Kathmandu. A nights accommodation with breakfast at a 3 star hotel in Pokhara. Surface transfer from Kathmandu to Bensisahar by private car and Bensisahar to Chamje by local jeep then Pokhara to Kathmandu by tourist bus. Full board meal (breakfast, lunch and dinner) with tea/ coffee during the trek. Best available twin sharing accommodation during the trek. An experience, friendly, helpful English speaking guide and porter (2 trekker: 1 porter) and their food, salary, accommodation, transportation, equipment and insurance etc. All kind of paper work such as TIMS and permit for ACAP. All kind of government and local taxes. Meals not specified in the ‘Meal Inclusion’ in the itinerary. International airfare, Nepal entry visa fee. Your personal expenses such as alcoholic drinks, cold drinks, mineral water, phone call, battery charge, laundry, internet etc. Expanses occurred due to the unavoidable events, i.e. road wrecks, flight delay etc.